So everyone, including myself, is losing their minds over the possibility of a Golf R wagon hitting our shores. The problem with that wagon is that it will be expensive, automatic, and probably not for sale here. 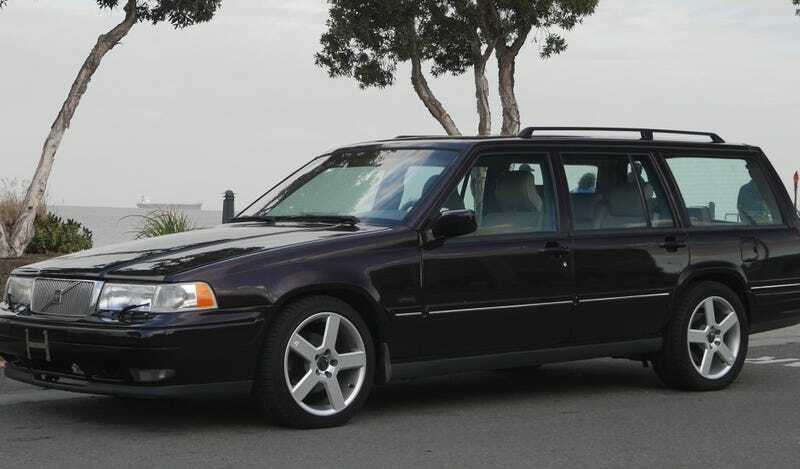 But you can buy this V8 Volvo wagon with 3 pedals for cheap. There are few problems that can't be solved with an LS V8 swap. I'm assuming the original owner was not satisfied with the output of this 1997 V90, so he crammed an LS1 from a GTO mated to a 6-speed manual and let the magic happen. Brought to us by our friends at Bring A Trailer, this V8 swapped V90 has a current bid of only $7500, but it needs a bit of work. While the motor only has 20,000 miles on it, the car is not sold with a BAR compliance sticker, which means you can't register it in California. However, the owner is including an exhaust system and O2 sensors that should help the car become smog compliant. Other imperfections include a radio that doesn't work, a sunroof that is stuck in the closed position (better than being stuck open), and some mismatched doors and poor fitting doors. The engine swap also did not include an A/C fitment, and the owner does say there is some drive-line noise. This car is probably best for someone that has some wrenching skills and is willing to finish the project. But if you need a nice brick for hauling, and prefer some small-block V8 goodness, this 350hp wagon is a great stealth machine.